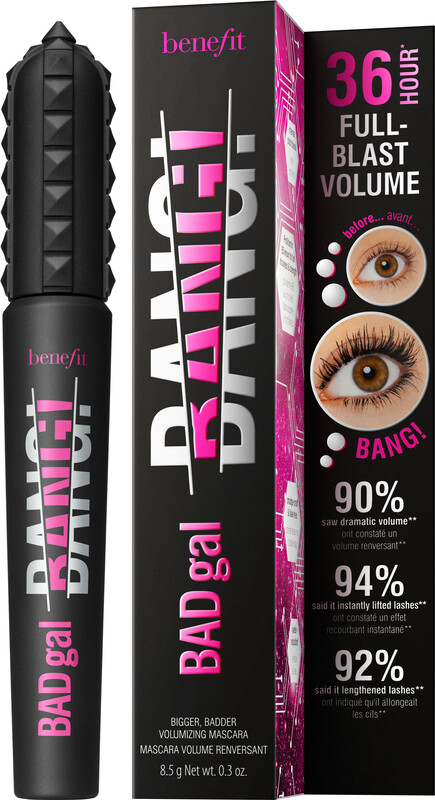 Create out of this world volume with the Benefit BADgal BANG! Mascara, a weightless mascara that lifts and lengthens lashes for up to 36 hours. The Benefit BADgal BANG! Mascara is bigger and badder than ever before. Its lash-boosting and lightweight formula will take your lashes to the next level, no matter their length. Infused with gravity-defying molecules, BADgal BANG! contains aero particles, an extremely lightweight space-derived technology that helps to lift and add extra dimension to your lashes without a clumpy or overdone look. Its blacker-than-black shade lets you layer and build the mascara for maximum impact. Smudge-proof and water-resistant, it’s easy to make the most of each and every lash with the streamlined slimpact! brush. Apply in zigzag motions from side to side. Layer as desired. Benefit BADgal BANG! Mascara 8.5g is rated 3.7 out of 5 by 3. Rated 5 out of 5 by Hip88 from Amazing Product Finally a mascara that works on very fine lashes. Colour payoff is great - black as black and stays on all day. Rated 5 out of 5 by Snoopydoopydoo from Love it! This is the best mascara I have used for a long time. Applies easily, doesn't clog, lasts all day and removes easily.